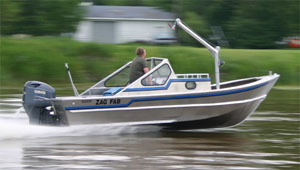 Welcome to ZAG FAB Boats Inc.
From our centrally located plant in Riverton, Manitoba, Zag Fab produces heavy duty all welded aluminum boats. We build a line of standard models from 18' - 32' with many different layouts and options available. Zag Fab's quality and performance has been proven through many years of rough and tough commercial use. Our reputation for highest quality design and strongest construction speaks for itself. Our continuously welded invincible hull provide a lifetime of trouble free use. All material is the highest marine grade of salt water aluminum available. During construction, the boats are subjected to the strictest quality control guidelines, also every boat is lake tested before it leaves our facility. We can custom build any boat for any application and produce larger vessels upon request. Copyright © 2008 ZAG FAB Boats Inc.